REESE'S Peanut Butter Cup Miniatures are a snack size combination of peanut butter and chocolate, perfect for candy lovers of all ages. Treat yourself to smooth, sweet milk chocolate and creamy peanut butter filling. 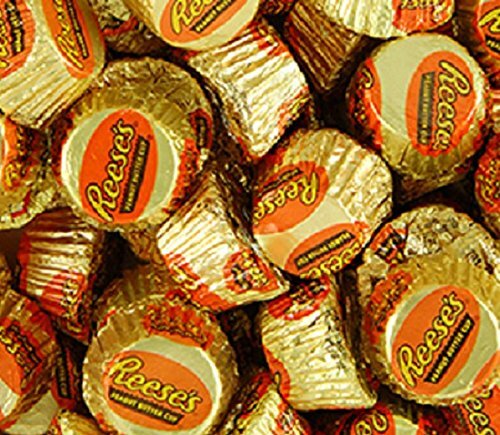 REESE'S Peanut Butter Cup Miniatures are the perfect snack for the office, home, or on the go. Share them with friends, save them for an afternoon treat, or use them in baking to create your own unique desserts. Contains only 220 calories per serving size. REESE'S Peanut Butter Cup Miniatures are OU Certified as a Kosher food. This candy is a gluten-free food as defined by the Food and Drug Administration. This product ships as a 25-pound box. If you have any questions about this product by Reese's, contact us by completing and submitting the form below. If you are looking for a specif part number, please include it with your message.